In my previous blog post I discussed how the time intelligence function CLOSINGBALANCEMONTH worked great, except when it didn’t. If you remember, the problem was the function CLOSINGBALANCEMONTH could not handle situations where the data had gaps, or blanks on specific dates. In this post, I want to build a measure that returns the closing price for the date in the current context. My initial attempt at this measure is going to suffer from the same issue we faced when working with the CLOSINGBALANCEMONTH function in the last blog. Let’s start by using CALCULATE and LASTDATE. 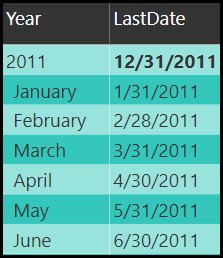 Here is your MSDN definition of LASTDATE: “returns the last date in the current context for the specified column of dates”. If the current context is month, LASTDATE returns the last day of the month. 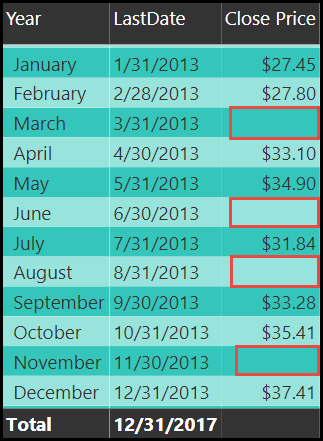 If the current context is Quarter, LASTDATE returns the last day of the quarter. If the current context is day, the day in the current context is returned. This means that the LASTDATE function automatically works for each level in your date hierarchy, this is why we like working with DAX, because of this type of functionality. As you can see in this screenshot, LASTDATE is returning the last date of the current context, in this visual we have the month and the year. If we take a look at the results in our table visual, we will see that our measure is returning blanks for certain months. 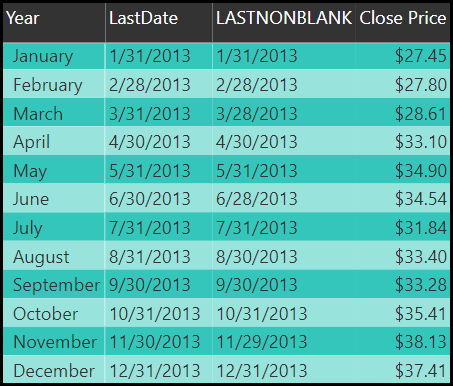 The reason this is occurring is because the stock market isn’t open every day of the year, therefore, if there is no closing price for the last day of the month then a blank value is returned. LASTNONBLANK will return the last date in the current context that wasn’t blank, that is the perfect function for this scenario. Let’s take a look at the results of LASTNONBLANK compared to LASTDATE. 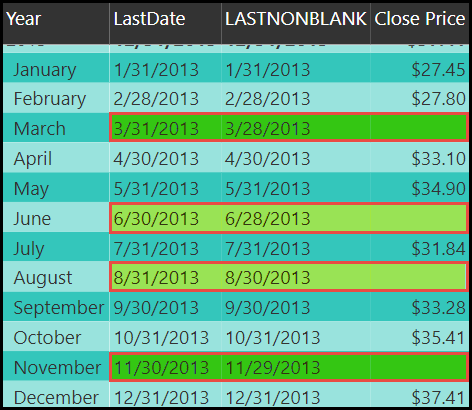 In the highlighted sections below, notice that for each area where the close price is blank the results of the LASTDATE function and LASTNONBLANK function differ. As previously discussed, the stock market was closed on the last date of the month and therefore the close price does not return a value.